If a picture really is worth a thousand words, this would be a very short post. 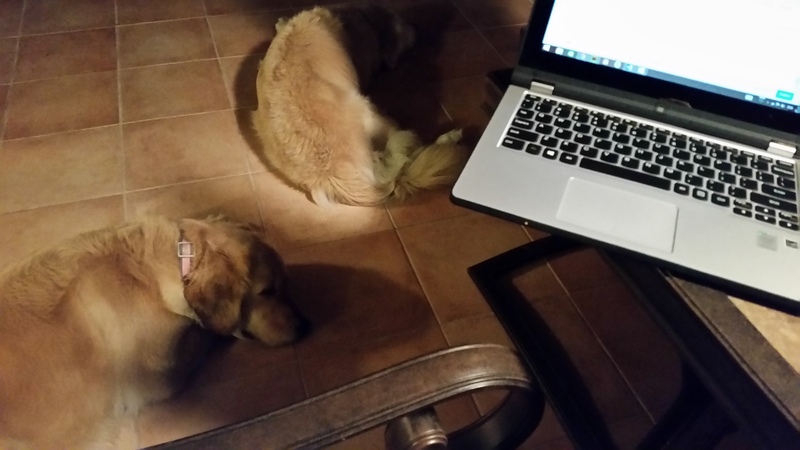 I thought some of you might be wondering where I’ve been, and why I’ve missed a week here and there. The story is way longer than I can tell, and probably more than I know, or you want to hear, but the gist is deteriorating health for the past year. The Perfect Storm for my immune system. My mother’s last year of life, her final week and her death, along with the months it took to settle her affairs took a deeper toll than I was aware of at the time. Grief can be cruel to the body. I haven’t found Normal on the map. I was sick most of the time I was in Switzerland with MD, went downhill from there, spent Christmas day in bed, and never really recovered. That began rounds of antibiotics for one infection after another –all lab verified—until the bacteria grew resistant or I developed allergies, and ended up at infectious diseases receiving a week of IV antibiotics. It took replacing a smelly carpet in the kid’s guestroom to lead us to the larger picture. 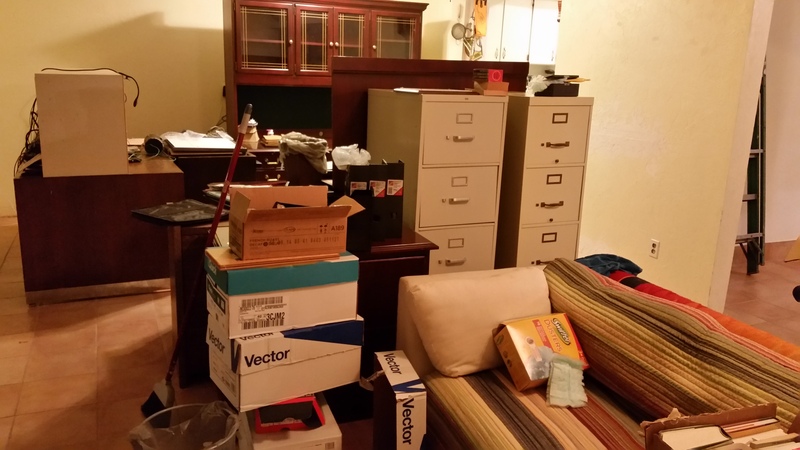 Not realizing, still, how much it was effecting me, I worked on the remedy one room at a time, as I had the energy to box things up and clear them out for the carpet layers. They found mold in the walls. The sheet rock needed replacing. Then painting. 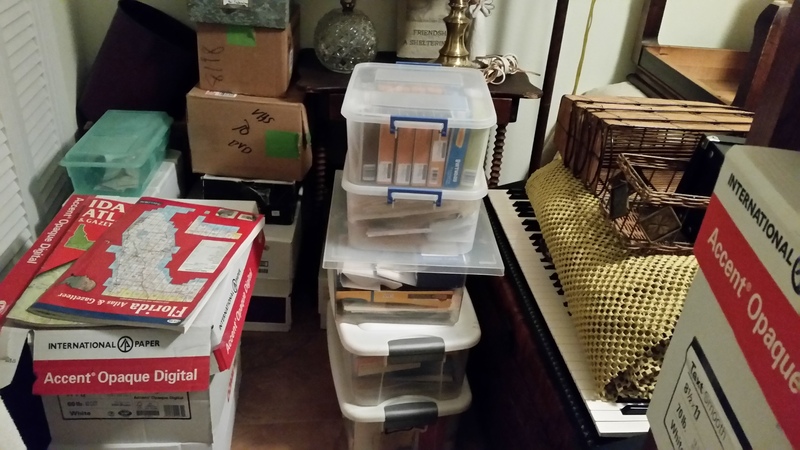 Then unpacking . . . Months later, on a severely restricted diet of mostly meat, fish or poultry and green vegetables, probiotics, and an antifungal twice a day, most days I was functioning well for a few hours. I finally had enough energy to focus on the main living area, where we’d had a beautiful oak engineered wood floor laid several years back. It had begun to show black streaks, in the grain, growing bigger and more pronounced. In a few heavily trafficked areas it actually came to the surface and broke up the wood. A team of water detectives had told us the water table was too high for our sunken floor, so I researched alternatives and landed on a special coating for the concrete, and porcelain tile. 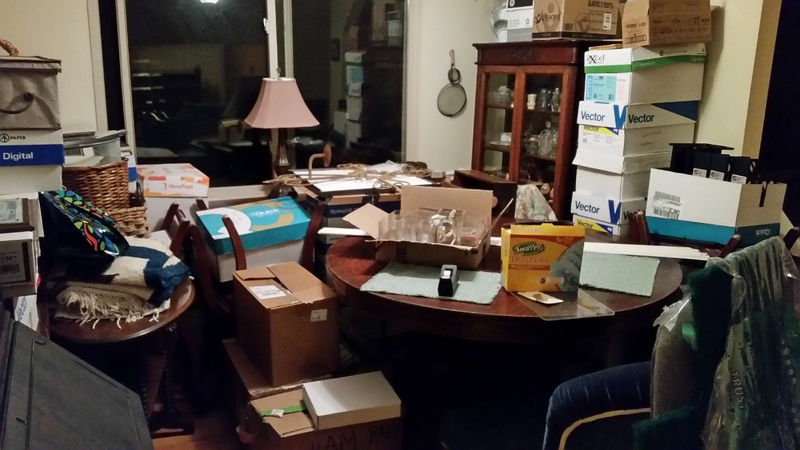 I scheduled the new tile floor, then started boxing up the living and office areas, which meant sorting and boxing a lot of books! It was so hard to part with my Writer’s Digest and The Writer magazines from many years back. But who was I kidding? If I hadn’t read them or re-referenced them by now, when would I? 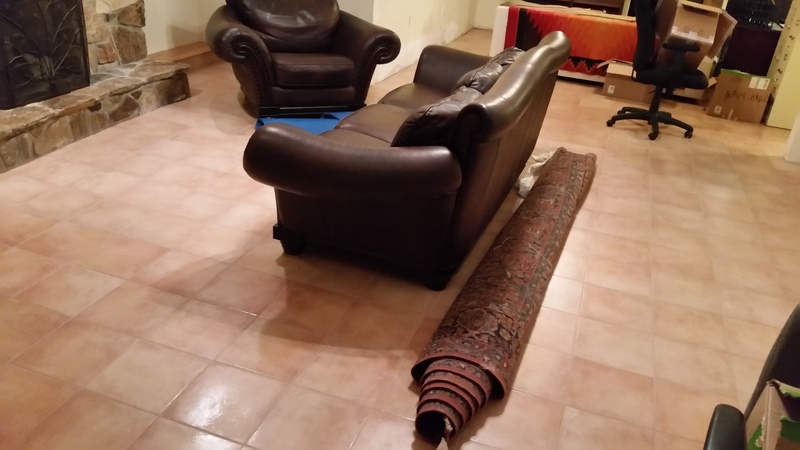 A few days before the work was to begin I had the large Persian rug picked up for cleaning, and we rolled up the thick felt pad. My good hours quickly diminished to hardly being able to get out of bed. It was only in retrospect that I realized that by clearing out the living room, we’d allowed more mold spores into the air. Advised to stay out of the house while the flooring was replaced, I packed my things and gathered food and toys for the dogs, who were going with me to YD’s. 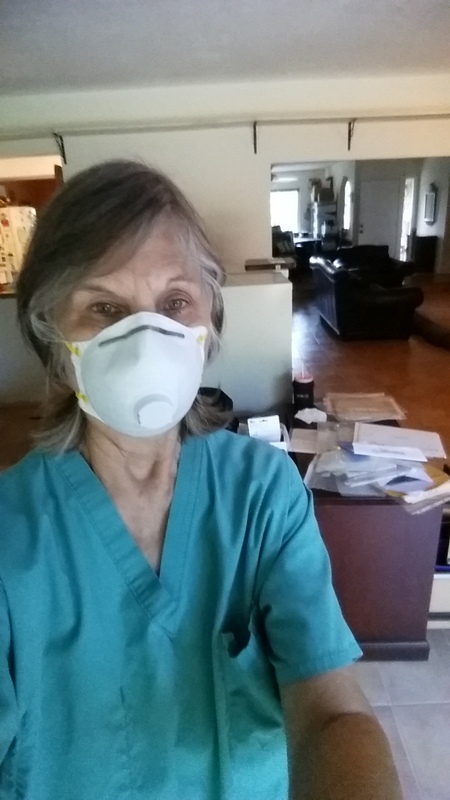 I stayed there two extra days, giving time for things to settle, for my husband to replace the A/C filters, and the construction dust to be cleaned. The day I returned, I’d only been in the house an hour when I headed to bed. Too much moldy dust remained in less obvious places. My oldest daughter took me to her place, to a bedroom with an air filter and lots of TLC. 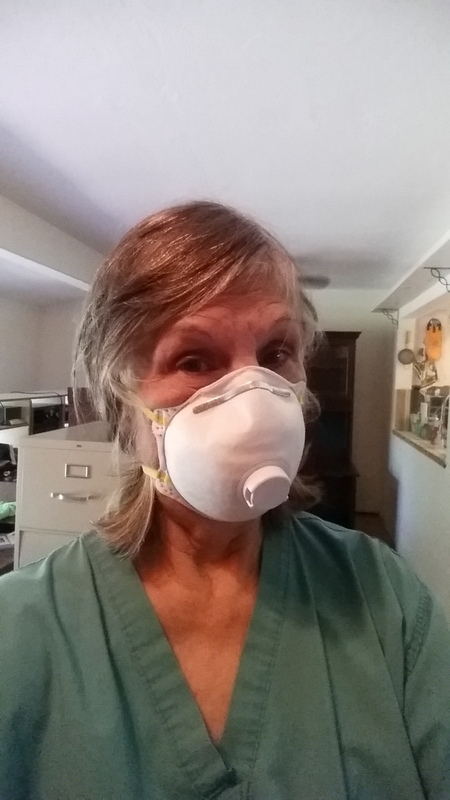 I was only able return to the house by wearing a face mask approved for mold. For days I have cleaned like crazy (with disposable masks and gloves) and collapsed into bed (after a thorough shower). 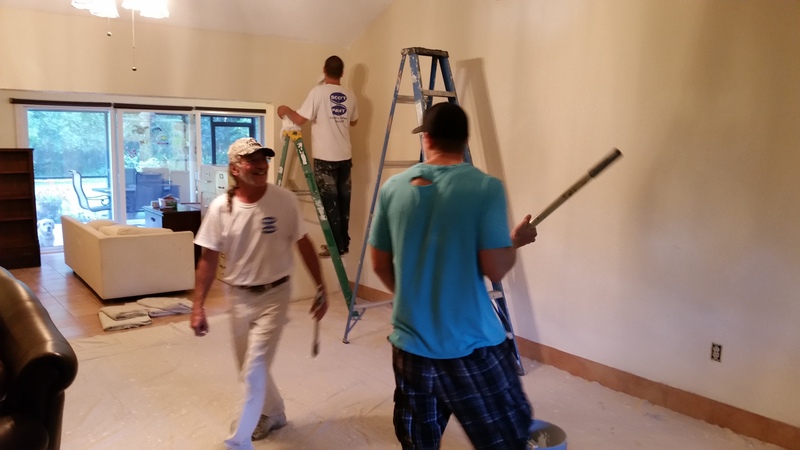 The painters finished yesterday. Today I had the house open all day, airing out the paint fumes I’ve grown so sensitive to. The last few hours I have been able to go without the mask. Pure relief! Tomorrow or the next, the tiler will finish the tile baseboards and help us move the rest of the furniture back in place. Of course, with a new floor and fresh paint (with a bold accent color) it is begging for serious decorating and far more aggressive thinning than I was able to do when boxing everything up. The good news is, I’m so tired of having to deal with all the stuff that I’m feeling much less frugal or sentimental about hanging on to everything. I’m too tired for so much stuff. And it’s been over a year since my mother died, so I’m ready to let go of many of the memories, and the little pieces of paper with her handwriting. Hopefully, I will soon have a clean, fresh, much leaner and mold free environment. and have the energy to sail with my husband. And have a clear mind to write. Sooner or later, we are all bound to have them. What are the storms in your life? God bless you. Hope all will continue to get better for you. You are an amazing lady. We admire you so much. Thank you, Martha. You are a real inspiration for me. Jane, I’m sorry for your loss. I lost my mother in March of this year. While it is a relief that she no longer suffers, grief is a process, isn’t it? As to your mold problem .. I’m exhausted just reading about it! and wonder if that is my daughter’s problem .. Glad to hear you are on the mend. My mother had been declining for so long, and was so miserable with her life as it was, since she never lost the knowledge of her former abilities, that I expected it to be a relief. I had no idea how hard it would be with that mother-hole in my life. I’m glad to meet you and look forward to the journey together.